For over a year, CyArk has been based in downtown Oakland, home to many amazing Art Deco architectural masterpieces. We are fortunate to have our office in the famous Breuner Building. It was designed in 1931 by Albert Roller during the heyday of the Art Deco movement. The building is also widely known for the color and texture of its sea-green terra cotta. The exterior terra cotta was the first example of machine-made ceramic veneer. Highly stylized motifs decorate the facades of the building and incorporate scenes of industry and organic forms characteristic of the Art Deco movement. 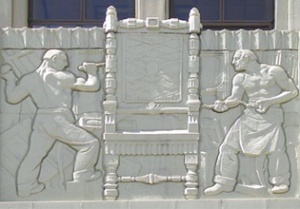 On the front facade of the building are two workers crafting a chair, symbolizing the original intention of the building as the John Breuner Company Furniture Store. The John C. Breuner Company was founded during the Gold Rush by Breuner, a young German cabinet maker, who had come to California to mine for gold. In 1856, he opened a small furniture store in Sacramento that became well known for its hand-crafted quality and later was transformed into a larger furniture operation. The business was taken over by his two sons who moved the company to Oakland. The 1931 building was designed to house the complete Breuner's operation, including shops and warehouses. The Breuner Furniture Company opened this store on 22nd and Broadway in downtown Oakland. At this time, the grand Paramount and Fox movie palaces were already established, just down the street as they are now. The Breuner Building once had a sign atop it which has now been replaced by a single flagpole. 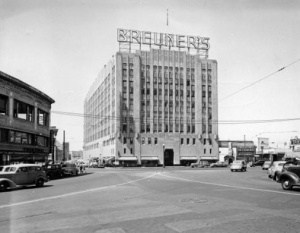 Breuner's Oakland store closed in 1976 and the building was subsequently bought and converted into first-class office space. Yet, the Art Deco masterpiece still stands proudly as one of the most famous landmarks in downtown Oakland. Laser scan data of the newly-renovated Fox Theatre nearby in downtown Oakland. 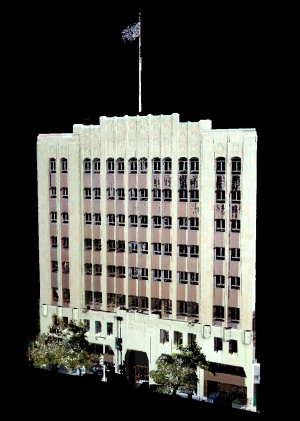 Photo-textured laser scan data of the Breuner Building of downtown Oakland. CyArk's office is on the sixth floor.